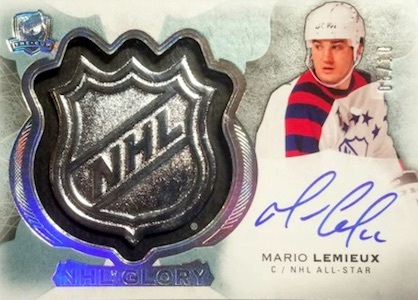 The pinnacle of NHL card collecting, 2016-17 Upper Deck The Cup Hockey closes out the season with a high-end bang. 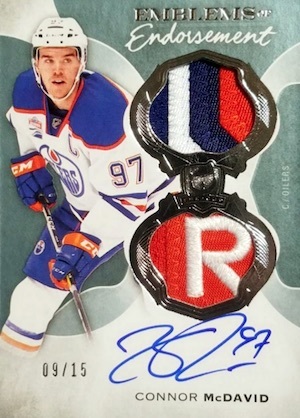 Staying with its premium format from 2015-16 The Cup, every box has two autograph relic cards, and one of these is guaranteed to be a rookie autograph patch. 2016-17 The CUP Hudson Fasching Rookie Masterpieces Printing Plate Auto 1 1! Mikhail Sergachev 16-17 The Cup Monumental RC Patch AUTO SP 6 Monster HIT!! 2016-17 The CUP Pavel Zacha Rookie Patch Auto 212 249! 2016-17 The CUP Pavel Buchevich Exquisie Rookie Patch Auto 12 89! 2016-17 The CUP Christian Dvorak Rookie Masterpieces Printing Plate Auto 1 1! PARALLEL CARDS (Many are signed): Gold Spectrum #/12, Gold Patch #/8, Red Tag #/4, Green Button #/3, Black 1/1, Black Shield 1/1, Masterpiece Plates #/4. Not all players included in the parallels. See the spreadsheet for specific info. 84 cards. Shop RPA cards on eBay. PARALLEL CARDS: Gold Spectrum #/36 or #/24, Gold Patch #/24 or #/12, Red Tag #/8 or #/4, Green Button #/3 (Not signed), Black 1/1, Black Shield 1/1 (Not signed), Printing Plates #/4. 16 cards. Serial numbered #/249. PARALLEL CARDS: Gold Foil #/24, Red Foil #/8. 1 card. Serial numbered #/9. 9 cards. Serial numbered #/12. 17 cards. Serial numbered #/24. 6 cards. Serial numbered #/18. Overall odds - 1:8; specific group odds noted below. 42 cards. Serial numbered #/15. PARALLEL CARDS: Patch #/5, Tag 1/1, Premium Material 1/1. Not all players included in 1/1 parallels. See the spreadsheet for specific info. 50 cards. Serial numbered #/25. PARALLEL CARDS: Gold Premium Material #/10, Red Tag #/2, Green Button 1/1 (No #OIL*). PARALLEL CARDS: Gold Premium Material #/5, Red Tag #/2, Green Button 1/1 (No #NYI*). PARALLEL CARDS: Gold Premium Material #/3, Red Tag #/2, Green Button 1/1. 47 cards. Serial numbered 1/1. 51 cards. Serial numbered #/35. Overall odds - 1:7; specific group odds noted below. Overall odds - 1:100; specific group odds noted below. Overall odds - 1:33; specific group odds noted below. PARALLEL CARDS: Black 1/1 (No Provorov*). All cards limited to four total copies. See the spreadsheet for specific info. What can be said? Who is dumb enough to pay these pre-sale prices? In Canada we have $799.99/tin as a pre-order price! In the US we have $654.95/tin as a pre-order price! You guys selling this can choke on it. You won’t see a dime of my money. If you want to turn a person off from buying hobby products, these ridiculous pre-sale prices are a sure fire way to do it. This is not Hobby hockey cards this is GAMBLING and nothing more. all sport cards are just a piece of card board and that’s it try taking a card to your bank and ask them to get a loan and put card as deposit or take it to the grocery and see how much vegetables you can buy with a sports card. This is why I have stopped buying these useless cheap less cardboards cause that’s all they are. 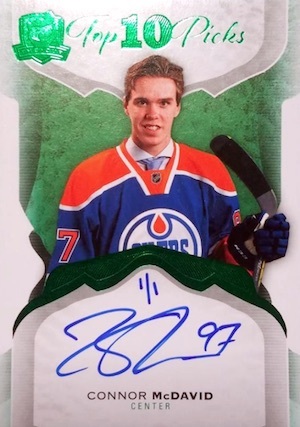 excollector – the fella who just sold the McDavid Cup RC for +/- 20K disagrees. That’s a lot of veggies. AL. I’m certain he spent more than $20,000 to get that card. If I’m wrong then he won a lottery while everyone else ended up with Marty turco cards 😀 UPPER deck is wagering it all down. They are producing more and charging more. Mike, that’s exactly right. 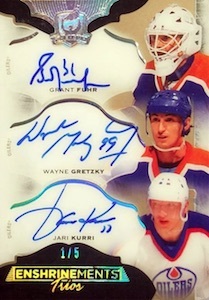 Ask any of these guys who pulled the McDavid Cup Rc & see how much $$ they had to put in before they finally hit it. 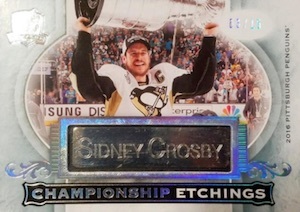 I don’t know…I like hockey cards but there comes a point when you just quit out of the sheer stupidity of costs. Sorry, but $179 for a bingo balls random case break of the cup?? Ridiculous, so no thanks. I’ve joined the bandwagon of only buying singles now. The good news is my coffee tastes great this morning & only cost pennies a cup! Getting back to the roots, if anyone has kids, show them how much fun collecting the Timmy’s set is. Good old fashion set collecting for fun. What a concept!! James, my son has started doing breaks on YouTube and we have been trying to put an emphasis on tips for kids who are getting into card collecting. We’ll be talking a lot about completing sets and how to properly care for your cards. I still buy some breaks on the side for myself but he has loved the experience of collecting the lower end sets. The price point yet again for UD The Cup is plain absurd! 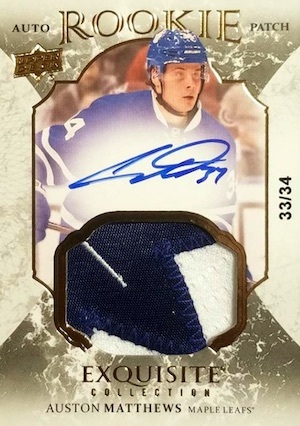 Team buys were released this morning and $1500 Canadian for the LEAFS….PLEASE! Just a joke anymore. Unless you get Auston Mathews & he has a stellar career your STILL losing $$$. BTW UD quit putting redemptions in THE CUP already! If a player refuses to sign and out of frustration you decide to opt for a “comparable” replacement you rip-off the collector by giving them pure garbage instead. Actually had a employee at UD try and offer a $80 US credit for a Pastrnak RC Auto Tag Red Foil out of 3! I think I made my point! I read on a hobby board where one of the members had worked out the math on the Cup. His data, a 99 rookie RPA comes out 1:4.25 cases For Matthews to be specific 1: 25 cases. Long odds and good luck to all chasing those cards. UD is making as much as they can for this years CUP – since next year and the few after that..they will need to really drop the price of this to get anyone to pay for it.. I suspect that somehow some cards from this years set will be kept back.. and then inserted as updates next year…. for example — I expect the some Matthews cards to be harder than what the numbers show here.. and that they will -(not surprisingly) show up in next years product..
can you imagine.. the poor guy who busts the odds of getting a #d rookie of 99..only to be……Puljujarvi.. 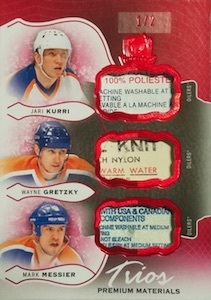 I usually buy Upper Deck Ice and depending on the rookie year, I usually buy 3 or 4 boxes of The Cup. Last year, I bought 5 boxes from different cities. I got a McDavid 4/99 and a Panarin 64/99. The price I got for Canadian pre-sale for 16-17 The Cup was $599.00 and with taxes it comes out to $700.00. I like this years rookies /249, but I don’t think Vesey should be /99 when some cards on the list at /249 could possibly be worth more or sell for higher during the present. I gave this review 3 stars because the rookies /99 are very weak. Even if someone pulls a Nylander or Marner, it will maybe pay your box. If you can’t afford the gamble as a collector, then avoid. I know some people who buy 2 cases because they can. There’s something for everyone out there in the hobby world no matter what your budget is, and I like that diversity. Matthews RPA is not the only card in this set with a real value. There are many other cards to be pulled, and I’m not talking about the RPAs only. Also, sure this is gambling, this is the way it is. As Pete said, there are cheaper collections out there. Nobody forces anybody into buying this product. As for myself, last year for example, I decided not to purchase it and I didn’t. There are people who just want to collect only expensive cards and have the money to do it. I’m a single cards seller and I know that whenever I buy a High-End and open it, I will most probably lose money. But, as strangely as it may sound, I almost always break at least even with the Cup. On the other hand, I agree the prices are absurd. Paying 130/140 CAD per card in average it’s just crazy, especially that one of those 6 items will most probably be a base card or a jersey. So you’ll end up paying 160$ per card in fact. Also, Pete, I doubt that a Marner or a Nylander will only pay for the box. I think they will sell more than that. To the cry babies, ripping packs has always been a gamble. Just like the price of the product, the value of the cards has gone up exponentially. Even low end products like Series 1 and 2 are a gamble. You aren’t guaranteed the value you paid in return. But if you hit a Matthews Young Guns or specialty card, you got several boxes in value. If you hit a Matthews /99, you’re looking at $10k minimum. Maybe you paid $1,400-$1,600 or maybe you paid $170 team random. You win/you lose. That’s collecting. How many people can say they hit a $10,000 card? Don’t buy or participate if you don’t want to but stop making it out like your the victim of something. There are plenty of price point products for everybody with great return value. I used to work for upper deck and this will be distributed in 2 waves! Expect a lot more matthews rookies than expected! I would rather stick to the low end product and be able to put an entire set together than spend the ridiculous prices being charged on products like these. Sure you can get a nice hit if your lucky and walk away with a pile of cash but most people will walk away with a big loss on what they purchased. Speculators and high end collectors have ruined the hobby which should be focused on the fun factor of collecting not the potential profit. 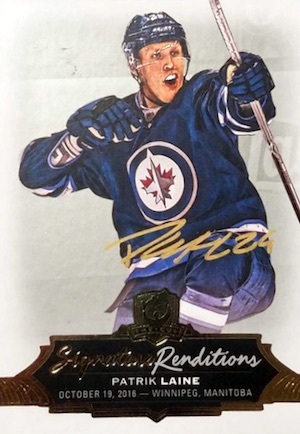 How can someone pay or want to pay 725 for a photo shoot rookie auto patch when you can buy a 120 dollar box and get the same photo shoot auto? What happened to game used? 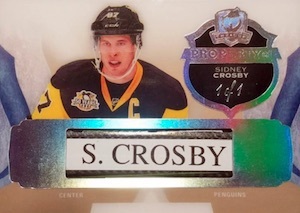 If you happen to put a rookie jake Guentzel auto rookie patch out of the a box and it was game used,it would be more valuable because he won the cup that year or any of the penguins. It just junk anymore. You’re gambling with junk value and the hobby is dead period. Bring back game used doesn’t upperdeck own the rights? Good luck on hunting those RC photo shoot autographed stickers, there’s nothing more to add really. here we go again people complaining about price. its getting old fellas, you will never get the cup for $ 400 a box. you guys want champagne cards at light beer prices. I agree with clayton. I hope you all don’t buy so that in future years the price will come down and I can get the best hockey product cheaper. if you guys didn’t think busting wax was a gamble are you wrong about the hobby. cup is like betting $50 on a black jack hand instead of $ 10. grow up and quit whining. Is there really not a single New York Ranger in the base set!? Not even Lundqvist!? WTF? Stop telling people top be quiet about the price! It has nothing to do with who can afford it. So, if you can afford it that makes it ok for it to delivery terrible value? This version is the worst by far. yes, some designs are nice and you can hit a “monster” card. The issue is, UD has become stale, boring and predictable the past few years. This has nothing to do with the exclusive, they just don’t think in terms of innovation anymore. Get used to that. UD has become about making money to survive. The price of this product warrants much more vintage or legendary players, not 80 deep on rookie auto photo shoot patches! : I have watched a half dozen case breaks and got into one random where I got Calgary (got Jankowski 249 and Tchachuk brilliance). I would say that having two base cards in almost every box does makes for a rather thin distribution of hits. Seems like Toronto always gets at least 3, somehow the Wild get 2, Calgary gets 2, Rangers get 2, BJs get 2…so that’s about half right there. There was a guy in mine that literally had over half the teams for about 2 gs and I think got about 300 in value back. The Cup has been around for a long time and the price has always been fairly steep. This year, the quality of the cards, in general, is great. 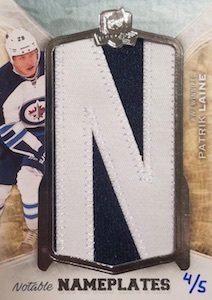 But, how come the patches of rookie cards are so small and dull compared to those in Premier? Hard to understand. My main complaint is about Upper deck. It seems harder and harder to buy a hobby box these days. Look at the price of even the cheapest product. How can young collectors afford to buy them? I too feel uncomfortable to pay a few hundred dollars for a box with 1 pack. Have you noticed that the average price for any card in a pack is going up and up every year. So, Upper deck and other companies are now producing cards knowing very well that the only way collectors can afford them is to join group breaks and this is not healthy for the hobby. I know, the hobby is not what it was many years ago but I miss the good old days when buying and opening a box was a lot of fun and……cheaper. If you can’t afford a tin of the cup because your local distributor and hobby shop pre-jacked the prices into the flipping sky, then just cheer on the rich gambler beside you. Well said UD. The fanbase adores comments like these. Anyone who is upset over a product like The Cup is somebody who doesn’t understand the business – because that’s what it is: a business. Do you really think UD cares about your hobby? If it weren’t for Leaf improving their products and their value increasing, UD would have a monopoly on the sport. It’s something you have to be smart about and make informed decisions if you want to be happy. The hobby is lightyears different than it was 10 years ago, let alone 15-20. Too many people look to make money on products. In no product whatsoever will everything you pull be of amazing value. If you can’t afford the gamble, don’t buy that level of product. Otherwise, I think The Cup cards are solid and have an aesthetic appeal. Yes, it is overpriced. But so is almost every other product. Why can’t UD put all those retired stars into a cheaper product. Now you get Arnhugy Tythsjy or Kuteyauua Liutiski in garbage breaks of their lower end products. Seen some box breaks of this product. There are usually two base cards per pack and some tins that have two base cards plus a plain rookie card. So that’s three possible cards without auto or memorabilia out of the 6. So thats 3 guaranteed hits for 700$. No top end product that comes out this long after the season ends should have redemptions. No top end product like this should ever have base cards, regardless of numbering. Nobody buys this product for base cards. Their only purpose is to water down the value of the product and fill packs. Also, how many case breaks have you seen this year with multiple RPAs of the same player? That’s just garbage and shows the piss poor attention to detail UD puts in its flagship product. But boy will it be great for the 1 guy on earth who pulls 2 matthews. I’m fine with whatever Upper Deck charges for their cards, collectors have the option to buy the product or spend their money elsewhere. What doesn’t make sense to me is why anyone would pay $20k for a Cup McDavid RC. The card has an autograph and a small piece of patch on it. For $15k, you can buy an entire game-used McDavid jersey from Meigray (a reputable website which works directly with the Oilers). You can use the $5k in savings to attend an Oilers game and get it autographed. I buy 3 of these boxes a year. I get what I get. Im happy, every time. It’s my hobby, I get together with other human beings and trade. Its different from living in your mother’s basement complaining, while you eat your Pizza Hut. This is an elite set. You can easily buy Upper Deck Series 1 and collect an entire set and wait for Series 2 to drop and do it again. In my opinion, cracking open 3 boxes a year, is a wonderful experience. If I hit the Lotto along the way and pull a crazy 1/1…then great. Box 2 coming Tuesday !!! As a young collector (High-school) without a steady income it is very hard to get into this hobby at all. Yes there are low end brands like MVP (worthless), OPC (Ugly), UD (hard to hit anything good), but those brands don’t have very many cards that look nice, feel nice, are good for a PC, or carry value. And even those brands are fairly expensive at $8 a fat pack tax in. and $30 a blaster before tax. In order to actually hit something nice you need to spend $100’s or get incredibly lucky. I manage to buy about 3 blasters every year and spend another $40 on singles that I want. I would love to even have a chance at hitting a very nice card from a higher end brand but those brands are so out of reach for young collectors that we are forced to get excited about 1:24 jerseys in UD1 or UD2… I would like UD to make an effort to give young collectors a chance at hitting cards to be excited about. This is mostly a response to an earlier comment by mb. I like the rarity of some of the cards. However, two of the same card in the same case tells me the cards need to be shuffled better. What can you tell me about card # SR-MM from this set?